It doesn’t surprise me that people don’t remember off-hand which of Tyler’s twenty books won the Pulitzer. She cranks out some solid books, but none of them is especially unique or noteworthy or memorable in subject matter. They’re about regular American families and the day-to-day struggles they face (loves and jealousies and conflicts and senses of duty and rivalries). What is memorable about her books are the characters and their complex, realistic relationships. 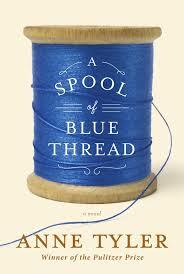 Her latest novel, A Spool of Blue Thread, is no different. I had the book with me on a recent doctor visit. “What’s it about?” my doctor asked when she walked in and saw me reading it. Without giving it much thought, I responded: “A family. Four grown kids. Two aging parents. They’re all trying to figure out how to maneuver as dynamics change.” And I realized immediately thereafter that I made the book sound horrifically boring. Nevertheless, my description was perfectly accurate. There was nothing remarkable about the Whitshanks. None of them was famous. None of them could claim exceptional intelligence. And in looks, they were no more than average. [. . .] But like most families, they imagined they were special. Mom, Abby, has been experiencing some spells. She is usually “scatty” and a little forgetful, but lately she has been losing herself for long moments. She forgets where she is and what she was doing. These spells bring the family (Jeannie, Amanda, Denny, Stem, and their spouses and children) together to figure out what their next steps should be for Abby and her husband, Red (who is losing his hearing, but is otherwise in pretty good shape). Should the parents leave the family home to move into a retirement community? Should one of the kids move in (and, if so, which one)? This process, of course, dredges up a lot of unresolved issues. The book is an in-depth look at the roots of those issues and the back-stories that make the Whitshanks who they are. There are family secrets (known to only a select few of the family members). There are extremely different perceptions of singular events. And, as you learn more about the Whitshanks’ history, you come to understand the interesting dynamics of their relationships (sibling rivalries, resentments, great loves). The quotation above is accurate: there is nothing remarkable about the Whitshanks. There’s a black sheep, a loony mom who tries too hard, feuding siblings, and a dad devoted to his work and his house. But Tyler manages to make this a book that is not one big cliché. Like all of her books, A Spool of Blue Thread is beautifully written (My favorite line for obvious reasons: “Her mother came from Virginia; everyone knew Virginians thought they were better than other people.”). The characters are her usual: realistically drawn with complex (sometimes surprising) histories. After I gave my doctor my blisteringly interesting description of this book, she asked me, “Is it a happy book or a sad book?” I thought about it for a moment and decided that (at least at that point, about two-thirds of the way through), it was a sad book. It is not always uplifting and it is certainly not happy-go-lucky . . . but it is a very accurate depiction of family. Tyler reminds us that unremarkable families like the Whitshanks are still unique and special if you’re willing to delve deep enough to find out what makes them tick. Who should read it: Mom (This is the kind of book that I lovingly tell my mother she should read because it is an “old-lady book.” It is very character driven and very family oriented (in an extremely realistic way—sometimes sweet, sometimes sad). This is the kind of book my mom would eat up with a spoon). This entry was posted in Rating: 3/5 and tagged A Spool of Blue Thread, Anne Tyler, Book review, Book Reviews, Books, Breathing Lessons, Pulitzer Prize, The Accidental Tourist. Bookmark the permalink. Um, Virginians ARE better than other people.